Reprimands and revealing testimony were the order of the day Friday, the third day in the Apple vs. Samsung trial. The morning started with presiding U.S. District judge Lucy Koh telling both legal teams that, from now on, all objections and reconsiderations must be made in person and would count against each side's 25 hours of trial time. This was in response to an inordinate amount of filings, some she called "ridiculous." Apple then asked Koh to keep Samsung from using what it called "confidential" and "competitively sensitive" Apple sales data as evidence in the examination of Phil Schiller, Apple senior vice president of worldwide marketing, arguing the information would aid Apple's competitors. They lost their bid to keep the data, essentially a customer marketing survey, from entering the public record, though Koh did allocate time for Apple's lawyers to file an appeal. Koh also rejected Apple's request to rule in their favor as punishment for a breach of court protocol by Samsung earlier in the week, when the company's legal team released excluded evidence in the form of a press release. Though Samsung got off the hook, Koh admonished lawyers for both sides, telling them she wouldn't tolerate theatrics or "any sideshow" to distract from doling out justice. She didn't let Samsung's team go either without telling them she believed they intentionally disclosed the evidence in an effort to further propagate it and possibly influence the jury. Koh then individually polled jurors to see if they had heard anything about the trial outside the courtroom. Most said they hadn't, though one admitted to seeing headlines referring to the case on their kitchen table. A pair of Apple employees and a Samsung mobile exec also took the witness stand Friday. First up was Schiller, who started his testimony by revealing the manpower and investment his company had made to ensure the success of the first iPhone. According to Schiller, industry insiders, the press and competitors believed the device would fail. He divulged the company's strategy for marketing the iPhone and iPad, saying the company adopted a strategy of advertising the products as if they were the most important things the company makes, describing the strategy as "product as hero." During his testimony, hard figures were presented as evidence showing just how much Apple spends on advertising for the iPhone and iPad, amounting to hundreds of millions of dollars. In 2011, the company topped out at $307.7 million spent on iPad ads. Schiller said he was shocked when Samsung's Galaxy S dropped, saying it clearly copied Apple's products and impacted his company's ability to market a distinct brand product. After seeing Samsung's Galaxy Tab, the VP said he believed the company would rip off Apple's entire product line. On cross-examination, Samsung attorney's repeatedly challenged Schiller on whether customers would really be confused in deciphering which phone is which. Schiller repeatedly asserted the two designs are confusingly close. Scott Forstall, Apple's senior vice president of iOS took the stand Friday afternoon, delving into the development of the iPad in 2003 and the 2004 conversations that generated the iPhone. Forstall said he asked the smartphone development team to come up with the double-tap feature introduced to iPhones in 2007. When asked if the feature is difficult to implement, Forstall answered in the affirmative. He also said the feature is a standout iPhone element. During Samsung's cross-examination, Forstall said he didn't remember seeing a Samsung phone with a click-wheel control - the SGH-E910 - during the iPhone's design process. A Samsung attorney presented an email chain between Tony Fadell, who developed of the iPod, Steve Jobs, Jony Ive, Jon Rubinstein and Forstall in which Fadwell describes his impression of the SGH-E910. Jobs forwarded the messages on to Ive, writing "This may be our answer - we could put the number pad around our clickwheel." Samsung's lawyer then produced a press release about a new Samsung phone forwarded from Fadell's team. The attorney would go on to show several more emails and a Apple breakdown of a Samsung smartphone, implicating the Apple team explored Samsung designs as it developed its products. In response to the breakdown, Forstall admitted Apple has done "tear downs" of competitors phones, including the Samsung's and the Galaxy S.
Forstall ended his time on the stand by saying he never instructed anyone to copy Samsung's designs because the company wanted to create something that no one had ever built. Finally, Justin Denison, a chief strategy officer for Samsung mobile, went under the lawyers' glare. 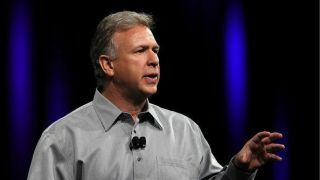 Denison said Samsung wanted to beat Apple by the end of 2011 though his company didn't copy their competitor to do so. One interesting revelation from today's testimony is that Jobs was apparently open to a 7-inch tablet, known by most as the fabled iPad Mini. Apple vice president Eddy Cue, as shown in evidence presented during Forstall's testimony, forwarded an article about Samsung's Galaxy Tab in 2011 with a note saying a market exists for a 7-inch tablet and Apple "should do one." Jobs, Cue said, was receptive to the idea.